Historical scientists frequently face incomplete data, and lack direct experimental access to their targets. This has led some philosophers and scientists to be pessimistic about the epistemic potential of the historical sciences. And yet, historical science often produces plausible, sophisticated hypotheses. I explain this capacity to generate knowledge in the face of apparent evidential scarcity by examining recent work on Thylacoleo carnifex, the ‘marsupial lion’. Here, we see two important methodological features. First, historical scientists are methodological omnivores, that is, they construct purpose-built epistemic tools tailored to generate evidence about highly specific targets. This allows them to produce multiple streams of independent evidence and thus maximize their epistemic reach. Second, investigative scaffolding: research proceeds in a piece-meal fashion, information only gaining evidential relevance once certain hypotheses are well supported. I illustrate scaffolding in a discussion of the nature of functional ascription in paleobiology. Frequently, different senses of ‘function’ are not discriminated during paleobiological investigation—something which can mar adaptationist investigations of extant organisms. However, I argue that, due to scaffolding, conflating senses of ‘function’ can be the right thing to do. Coarse-grained functional hypotheses are required before it is clear what evidence could discriminate between more fine-grained ones. I draw on omnivory and scaffolding to argue that pessimists make a bad empirical bet. It is a bad idea to bet against the epistemic fortunes of such opportunistic and resourceful scientists, especially when we have reason to think we will systematically underestimate the amount of evidence ultimately available to them. 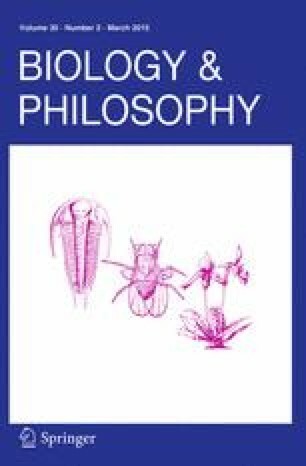 This paper was presented at the 7th Munich-Sydney-Tilburg philosophy of science conference, “Evolutionary Thinking”, as well as at Calgary and Otago Universities. I’m grateful to these audiences for their feedback. Maureen O’Malley, Leah Schwartz and Brett Calcott read drafts and provided incisive, constructive comments. The paper also benefitted greatly from the generous input of two anonymous referees.